We grew up in Northern Illinois. Now we are full time Florida residents and loving it! We are experienced and caring Realtors with long time experience in Selling and Listing Southwest Florida real estate from Punta Gorda to Bonita Springs. We live in Burnt Store Marina and List, Sell and Rent properties up and down the Burnt Store Corridor both Lee and Charlotte Counties. Our Marketing Program puts a strong emphasis on INTERNET MARKETING of your properties along with adding a 'Personal Touch' to our service. We specialize in both Single Family and Condos; Waterfront Properties, Golfing Communities, Vacation Homes, Staging of Homes, and Home Watch - both Seasonal and Annual RENTALS. If you are planning on Selling your home and/or Purchasing a home, or Renting your home Annual or Seasonal, please let us put our 30 years of real estate experience to work for you! If you live in or visit Burnt Store Marina, you just may see our friendly faces tooling around in our bright red #19 NASCAR golf cart above! 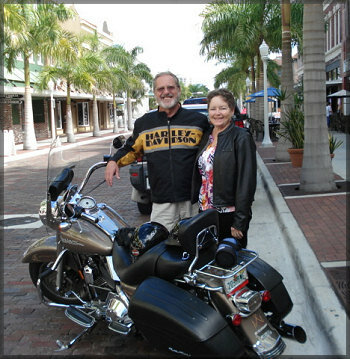 When not busy Selling, Listing or Renting real estate, Karen and Bill can also be seen riding their Harley Road King Custom to such favorites as Pine Island, Punta Gorda, Fort Myers downtown River District and Cape Coral seasonal 'Bike Nites'.